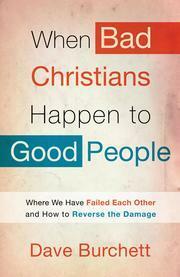 When Bad Christians Happen to Good People : Where We Have Failed Each Other and How to Reverse the Damage is a title that may be familiar to some of you. It has been re-released by Waterbrook Multnomah Publishers and updated by author Dave Burchett. Whether or not you have heard of it before, the title alone is enough to push your hot buttons in some form or fashion. It just comes at you with attitude and you, the reader, are left to grapple with it. Honestly, I really don't know what to say about this book. I feel both amply qualified to talk about it and terribly not qualified at all. (So I feel like I can let my sentences go, apparently.) If you are a Christian, no doubt the book title alone makes you snicker. Or groan. Or both. You know what Burchett is talking about before you even open the book cover. You are likely also confused by the title. Bad Christians? Good people? Who among us is good? We're all sinners saved by grace. How can he write this book? How can I read it? What on earth is this guy talking about? I asked myself all of those questions and a whole lot more throughout the entire book. I still don't really know why he wrote the book - except he does confess in this revised edition that he wrote it originally, in part, to spout off his frustration with Christians in churches today. The book was vaguely reminiscent of Blue Like Jazz (linked to my thoughts) in that Burchett didn't really care for the way that Christians are acting in the world towards other cultures and non-Christians. He simultaneously complains though that Christians are not different enough from the world and seldom take stands for truth when they should. The way that he presented his arguments and complaints made me want to ask him, "What is it that you want from me!?" It felt rather schizophrenic in its approach. Ok. Fine. Maybe even great. How are you going to encourage your reader to follow after Christ and recognize that thanks to Adam and Eve we are all born and sin and conceived in it? Tell us that we are always and forever going to be dealing with sin issues until we enter into Heaven - the only place where sin cannot exist. In the meantime, we're supposed to be in a body with one another, learning from the strengths and weaknesses of others, purposing relationships built in a certain degree of humility and angst so that God can make us more holy, just as He is. Based on the title of the book and the stated purpose of it, I would expect to be encouraged and have my faith bolstered by scriptures that talk about fellowship, the proper way to resolve conflicts with one another and the beauty of the church as the Bride of Christ. I didn't get any of that. I'm not even really sure WHAT I got so I conclude my remarks with a giant question mark. I did think that Dave Burchett had a marvelous sense of humor. I laughed really hard at some of his descriptions of Christians and Christianity - in much the same way that I laughed at Tim Hawkins' when he described the same. There is certainly a great deal to poke fun of when it comes to Christians. However funny it might be at times, the pain and wounds we inflict upon one another isn't really very funny at all and so I would expect that a title which professes to want to heal the church would actively work to do so. I don't think it does that. As unpleasant as the circumstances might be, the quicker we Christians are to realize that we are flawed and that it is only by the grace of God that we will ever learn to communicate and love one another effectively, the better off we will be. We cannot do this in our own strength and we should probably mentally accept the fact that we will not find our fulfillment in personal human relationships. The only perfectly satisfying relationship that we can ever have is one with God. I repeat: all of the others are flawed. BUT! It is in and through the flaws that God has set up a system designed to bless us. You might say it's ironic truth but it is truth just the same. In summary: I'm not much a fan of this book because I don't think it accomplishes its stated purpose. And also because I know that some of you are particularly aware of sarcasm, (because we have discussed it around these parts before! ), the author admits he has a sarcastic sense of humor and he is coming at you with attitude. He makes no apologies for this. I would say that this is a case where I can see that sarcasm has not served the user very well - for the hearer of it is left feeling very bewildered by the attempted communication. I do appreciate Waterbrook Multnomah Publishers' willingness to send me a copy in exchange for my honest thoughts which I have honestly sought to provide. The title of the book does catch my eye. I was hurt by a Christian organization I was doing missions through, and it caused my relationship with God to suffer tremendously. I am wondering if I should bother reading the book since your review seems to state that he really doesn't have any answers to this problem. He's just venting? I guess I am tired of venting and wanting the wounds to heal that I received from the *bad christians*. Without the things in the book that you pointed out that are lacking, it doesn't seem that this book would serve God's kingdom to bring the unity back where it's needed. I was wary of this title, and your review indicates that it does seem to be more about the author's venting than about offering solutions or a right perspective. You are so spot on that we are sinners and therefore we are going to hurt each other some times. We need to either confront and forgive each other or forbear and overlook personal offenses (Proverbs 19:11) but not stew over them. I've seen too many blogs and web sites with the theme "I've been hurt by a Christian so therefore I have a beef with all of Christianity and will henceforth forever." Being "frustrated by others for so many years that they have lost touch with their own relationship with Christ" is like saying "my brother hurt my feelings so I am going to get mad at my father." Yes, I've known of quite a few people who run away from the church because they've been hurt. I really have no genuine sympathy for that because I and my family have been wounded - severely - *more than once. * But that has never given us the "right" to run away. If you live around people, you will be exposed to their flaws. Fact of life. But given the fact that God also designed us to be relational, we must learn to work in His system. Pain will come to you. You will have your feelings hurt. You may be accused falsely, gossiped about endlessly, shunned and/or have your name mean little more than mud. It is certainly regrettable but instead of running away it would be better if we could come to understand that God refines us in such fires. And usually - we're somewhat to blame. "Do I gossip about others?" If the answer is "yes" and at some point along the road of life I am hurt by gossip, I shouldn't roll into a ball and refuse to speak to people for the rest of my life. Rather, I should take that moment as a learning moment and realize that gossip hurts and wounds. Then I should learn to not participate in it any longer, stay part of the body, and do my part to avoid gossip but instead build people up. I'm reading an altogether better book on this very subject right now by Paul David Tripp that I'm looking forward to talking about more. I think it's infinitely more valuable when it comes to interacting and dealing with the "bad Christian." Hmmmmm. . .makes me think some of "Mere Churchianity". I'd rather be inspired and/or encouraged after reading a book than bummed at how bad things are. . . I know Christians are imperfect, but I always have trouble sympathizing with that as a reason not to believe in Christ. So many other things are imperfect, yet people go along with them because they are necessary in some way. Hearing someone say that the flaws of Christians are a reason for rejecting Christianity always makes me purse my lips skeptically. I see lots of imperfection, lots of missed opportunity, lots of "lesser than our calling" in the church. But I'm not about to give up on it.